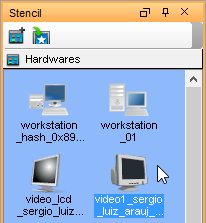 The Stencil pane is where user-created stencil shapes are stored. User can create a stencil shape on diagram by first displaying a stencil, dragging and dropping a shape from Stencil pane to diagram. Below are the steps in detail. Open the Stencil pane by selecting View > Panes > Stencil from the toolbar. Click on the (Add Stencil) button in the top of Stencil pane. Select a category from the pop-up list of gallery. Select the stencil to add. The stencil is then added to the Stencil pane. NOTE: You can add multiple stencil by repeating this step. Press on a shape in the Stencil pane and drag it out of the Stencil pane and drop it on the diagram to create the shape. You can also use generic connector to connect built-in notations shapes and stencil shapes. To do so, select Generic Connector in the diagram toolbar. Press on the source shape, hold the mouse button, move the mouse cursor to the target shape and release the mouse button.